New taxation rules that have seen Stamp duty increase while at the same time mortgage interest relief has been rescinded. The notorious Brexit effect – whose effect is still unknown. A sudden increase in supply due to new construction and home owners selling 2nd homes because of reason number one. On August 02, 2018, the BOE raised interest rates for only the second time this decade which may depress prices further. All this has worked to create a perfect storm that has caused the London housing market to contract. Since early 2017 a steady decline in property values in London has eroded the gains made across the UK as a whole. While places like Manchester, Birmingham, Liverpool etc. have seen double digit growth in prices, over 42% of the postcodes in London have seen dips in their values ranging from 0.7% to 8% in Central London. A diminishing appetite for real estate by buyers foreign and domestic has opened up the London market in a way not seen since the 1960s. For the savvy investor, willing to exercise patience, luxury properties in Central London may ultimately offer good value (believe it or not!). The recent increase in the interest rate by a quarter percentage point from 0.50% to 0.75% (the highest it’s been since March 2009) comes on top of the recent Stamp Duty hike, the changes to the Tenants bill and increases in capital gains taxes. The first Quarter of 2018 has seen standardized houses price in London dip to its lowest since 2015 £430,749. The number of ‘Listed’ properties valued at £1 million and above is slowly but surely increasing as other homeowners get spooked causing a ripple effect. You have to keep in mind that the average Joe on the street can’t afford housing in London anyway, so most owners tend to be property investors buying a second home to park their wealth, this unfortunately is not working out for people who like to flip houses and make a quick profit. Add to the above that tele-commuting is becoming the new normal, and you have even more first time buyers choosing to leave London for more hospitable(read cheaper) climes where the average price of a house is £224,000. This fall in real estate though is not comparable to and shouldn’t be likened to the mortgage crises that hit our shores back during the GFC. For one thing it’s mostly affecting luxury and high-net value properties and for another this is more of a market correction meant to rein in the inflationary trend of the real estate market that has seen prices almost double. Furthermore London, due to a variety of reasons, is seen to be recession proof, much like New York, which even at the height of the GFC maintained its real estate pricing. 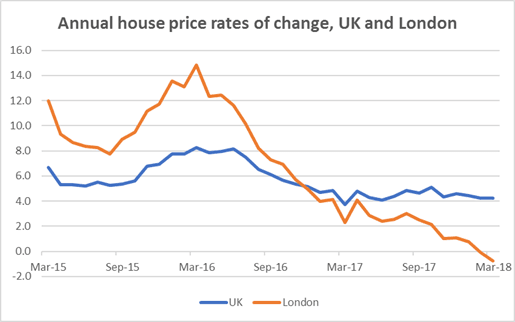 Despite property prices falling as much as 8% in some of the boroughs in Central London, if history is any guide to go on, prices may bounce back in a couple of years. The last decade has seen land values in London touch £1 Million per 25.2 square meters, making it one of the most sought after real estate locations in the world. The old world charm of the cobbled streets, the rich colonial history, world-class amenities, combined with the financial powerhouse that London is, makes attracting the largest investment houses this side of the Atlantic that much easier, which in turn make London a much sought after destination. Just ask Chinese and Middle Eastern investors if you have any doubts.